The Mohicans and Abenaki, along with the Iroquois were the main Native Indian tribes in Vermont. The French explorer, Jacques Cartier, in 1535 came through the region. Then, on July 30, 1609, Samuel de Champlain claimed Vermont part of New France and built a fort. By 1690 a group of Dutch and British settlers from New York came north into Vermont to set up a trading post. The first permanent English settlement was in 1724. The French in 1731 constructed a fort which gave the French control of the New France/Vermont border region in the Lake Champlain Valley. The British failed to take the Fort St. Frédéric four times between 1755 and 1758. Some 12,000 British troops forced the French out by 1759. After the French and Indian War, England was given permanent claim the Vermont lands. Vermont became the new frontier, especially with emigrates from Massachusetts, New Hampshire and New York. 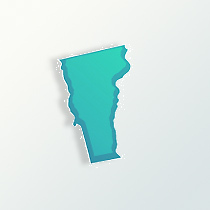 By January 1777, Vermont no longer had ties to New Hampshire and became a state. But at first with was the state of New Connecticut. That name changed by June 1777 to Vermont. Its state constitution abolished the institution of slavery in its constitution, provide for universal male suffrage and require support of public schools. Several battles during the American Revolutionary War occurred in Vermont. In 1791, Vermont joined the Federal union as the fourteenth state, and the first to enter the Union after the original thirteen colonies. During the early 1800s the people of Vermont had a serious opposition to the institution of slavery. Many men from Vermont fought on the Union side during the Civil War. In 1800 the population was 154,400 citizens in Vermont. By 1810, it had grown to 217,900. The increase only slowed down by the mid-1800s. In 1890 the population was 332,000. It remained in that range for decades. In the 1970s more people were emigrating into the state and by 2009, the Vermont population was 621,700 citizens. Examining Vermont genealogy, it is noted that most of Vermont’s people are of British ancestry. With the Scots-Irish, English, Scots and Welsh, they make up about 34 percent of the state’s population. The next group would be the French-Canadians at 24 percent who emigrated from Canada in the early 1800s. Most of the French-Canadians live in the northern section of the state. The Irish represent 18 percent, the Germans at 10 percent and Italians are 7.5 percent of the population. In Vermont, 98 percent of the total population are whites with European backgrounds, with less than 1 percent being African-Americans. The Hispanic population presents about 1 percent. These are significant numbers representing the white European background for Vermont genealogy. Those of the Roman Catholic faith, due to the French-Canadian settlers, are about 26 percent of Vermont’s population and the Protestant religions have 29 percent. The people of Vermont make a living with agriculture, tourism, forestry, fishing and hunting. Dairy farming is a big business in the state. The production of maple syrup has traditional industry in Vermont. The IBM Corporation employs about 25 percent of the citizens in Vermont.